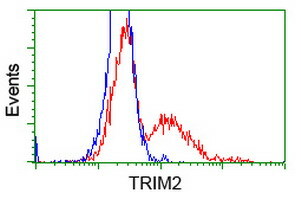 Mouse anti Human TRIM2 / RNF86 OTI1D2. 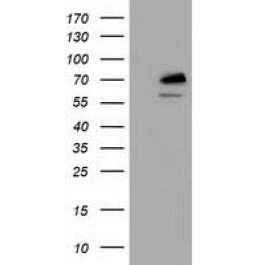 Human recombinant protein fragment corresponding to amino acids 1-100 and 645-744 of human TRIM2 (NP_056086) produced in HEK293T cell. The protein encoded by this gene is a member of the tripartite motif (TRIM) family. The TRIM motif includes three zinc-binding domains, a RING, a B-box type 1 and a B-box type 2, and a coiled-coil region. The protein localizes to cytoplasmic filaments. Its function has not been identified. [provided by RefSeq].